Claire at Tired But Happy posted recently about the power of "putting it off" when it comes to saving money. I'd like to say all my thrifty ideas are born of motivation, but more often than not, they result from procrastination. For instance, I keep putting off a trip to the Oreck store for more vacuum bags. 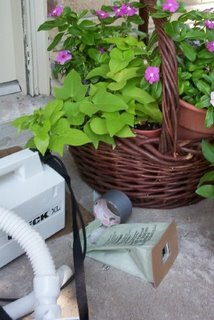 Instead, I take the full bag outside, empty it in the corner of the flowerbed, then roll and seal the end with duct tape. This is its fourth re-use and probably its last. I won't be able to avoid the Green Hills traffic forever! If you go first thing when the stores open at 10, the traffic is actually pretty light. Or can you get generic Oreck vacuum bags? We recently got a new vacuum and I started wondering where on earth I'd find bags for it, but in looking around on-line I found generic bags for about 1/3 the cost of the brand name ones. I found brand-name bags for my Riccar online -- first through ebay and then through an online vacuum shop. The price was much less ... and the hassle was much less than shopping in stores for those bags. I do that with my Oreck bags too! Also out of necessity. I thought I had one more left, but one I checked, nope. Not a one. So some bag surgery it was, and it worked just fine. Now that I know that it seems too wasteful to throw it away after the first use. I do that too!! Out of both procrastination and necessity. I read the comment about buying them online. I'm going to check that out. If I never had to get in my car again to run an errand, it would be too soon. Thanks for the mention, and hey, great idea. My honey researched for weeks before choosing what he decided was the best vacuum cleaner--a GE. Turns out we can hardly ever find the bags in stock. I'll have to try reusing them AND looking online. Why didn't I think of looking online? I'm only online, like, ALL THE TIME.